Here is humble banana bread with a bit of twist. I added some cocoa powder and walnuts. I must say that it's not really chocolatey. Cocoa is more like in the background. So, if you REALLY like a chocolatey taste, you'd better add melted chocolate. 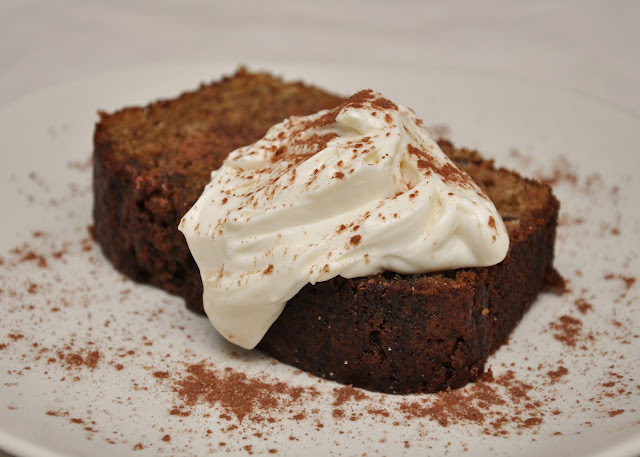 This is low-fat banana bread if you use low-fat spread rather than butter. Sieve the flour into a mixing bowl. Rub the butter (or low-fat spread) into the flour with your fingertips until the mixture resembles fine breadcrumbs. Stir the sugar, chopped prunes, bananas, beaten eggs and golden syrup into the dry ingredients. Mix together to form a soft dropping consistency. Spoon the mixture into the prepared loaf tin. Bake it in the oven for about 40 to 50 minutes. What would you do if you have only one egg in your fridge? Here is an idea for sharing one egg with others. It's a very basic recipe, so you can add dried fruit, chocolate chips, etc. 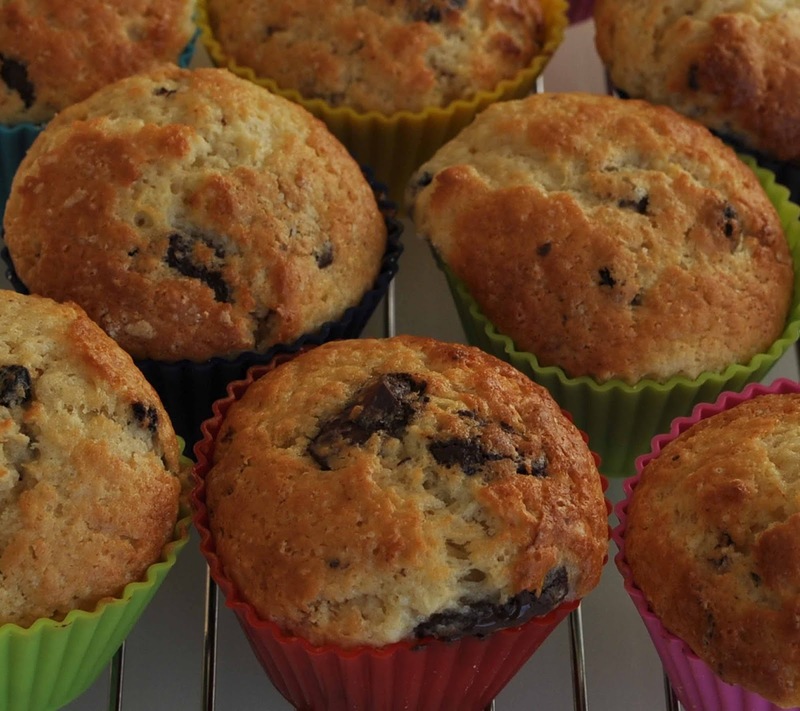 (I added chocolate chips for these muffins above... yum...) The texture of the muffin is very nice and bouncy. 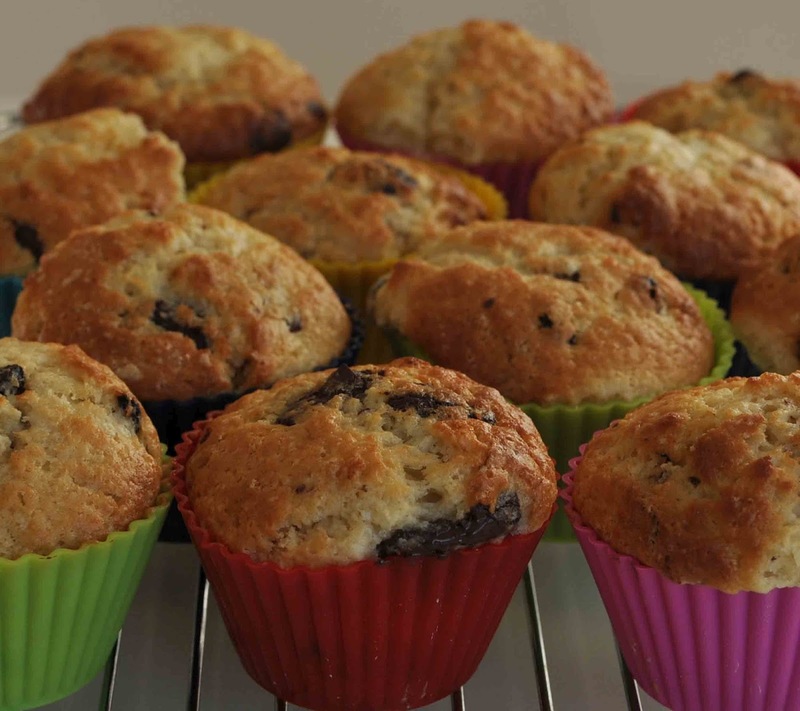 The batter is quite runny, so I was a bit worried about how the muffins would turn out, but they were light and moist. 14-16 normal size muffin cups. Scoop the batter into the muffin cups. Naughty but nice. Chocolate brownie is a comfort food, isn't it? Well..., why not once in a while! But I wondered if there was a good "guilt-less" chocolate brownie recipe. Then I found this! Chocolate brownies with mayonnaise which is called "ultimate makeover:chocolate brownies". MAYONNAISE in cake? I couldn't believe it, but I tried it for a laugh. They were really delicious. Noboby could guess there was mayonnaise in it. Very moist and light texture. Really chocolatey. The original recipe suggests using bicarb, but I use baking powder instead as I think the quiet taste of baking powder doesn't affect the pure taste of chocolate. I also used this recipe to make chocolate cake, and I just pour the mixture in a round tin to make a classy desert. It's a great for a birthday cake for someone who loves chocolate, but is low-fat minded. Meanwhile, lightly oil and base-line a 19cm square cake tin that is 5cm deep. Combine the flour, cocoa and bicarbonate of soda (or baking powder which I prefer). Using a wooden spoon, stir both the sugars into the cooled chocolate with vanilla and buttermilk. Stir in 1 tbsp warm water. Break and beat in the egg, then stir in the mayonnaise just until smooth and glossy. Sift over the flour and cocoa mix, then gently fold in with a spatula without overmixing. Pour the mixture into the tin, then gently and evenly spread it into the corners. Bake for 30 mins. When a skewer is inserted into the middle, it should come out with just a few moist crumbs sticking to it. If cooked too long, the mix will dry out; not long enough and it can sink. Leave in the tin until completely cold, then loosen the sides with a round-bladed knife. Turn out onto a board, peel off the lining paper and cut into 12 squares. I love my little muffin cups. They are heat resistant silicone and very soft and flexible. So, I don't need to oil them and I don't really need paper muffin cups. It has been quite sometime since they joined my baking equipment, and I love them as they look so pretty when the muffins come out of the oven. I love Tiramisu, the popular Italian dessert which has a strong flavour of coffee liqueur and rich creamy Mascarponi cheese filling. I used to work in a big language college that offered various modern foreign languages. The staff room was absolutely a melting pot, where I could hear an amazing variety of languages from all over the world. I loved the lively atmosphere. There we teachers shared tips and new methods for teaching, but some teachers also brought their home-cooked food. One of the Italian teachers brought in a large dish of Tiramisu for anyone to eat. It was absolutely delicious and it didn't take long for the large dish to be completely cleared. She said that her Tiramisu was very authentic and traditional, and that it was easy to make and did not need to be cooked in an oven. However, I'm now really into baking, I decided to bake a moist coffee flavoured cake and to add a generous portion of Mascarponi cheese filling. The ingredients are mostly the same as for Tiramisu but the technique and presentation are different. Here is my take on Tiramisu. Ah, I tell you, this is seriously good. Mix the butter and sugar with a spatula. Whisk the eggs into the mixture with an electric hand whisk. Sift in the flour, baking powder and coffee powder, then mix in the chocolate chips. Pour the mixture into a loaf tin. Bake at 180c for 30-40 minutes. Leave the cake outside of the oven for 10 minutes. Brush the coffee syrup into the cake while it is still warm. Mix the Mascarponi cheese, icing sugar and vanilla extract. Slice the cake and dish up on the plate, then drop the cheese cream on top. To be honest, I love kneading. Lots of people say that kneading is the hardest bit of bread making. But I find it quite enjoyable. Especially, when I'm baking in a lazy morning. However, when you have lots of other things to do and still want to have nice home-baked bread and don't have a fancy mixing machine what would you do? My friend Pam has an answer. Here is her "Staple Loaf" recipe. Apparently her husband is a regular baker of this recipe. I wasn't sure when I read this recipe for the first time. 12 to15fl of water for 1lb of flour? So, I tried 13fl for my first attempt. I didn't have black treacle in my cupboard, so I used brown sugar instead. The bread turned out very differently from the loaves which I usually bake. Very rustic outside and lots of bubbles inside. The texture was very different from my usual bread, spongy and bouncy. Lovely flavour. I really enjoyed it with "eggs in pots"
Put the flour and salt into a large bowl. Add the easy blend yeast to the flour and mix. Add the seeds, oatflakes and/or nuts, if using**, see below for details. Add the oil and treacle to the water, make a well in the flour and add water to make a wettish dough that would be just too wet to knead. Use a wooden spoon to mix. Put the dough in the loaf tin and smooth down the surface. Sprinkle with the sesame seeds and pat down. (Optional) Or egg-wash the loaf. Preheat the oven to 220°C/200C fan/440°F/Gas mark 8 (unless you know something different about your oven). Then place the bread in the hot oven for 35 minutes. When cooked, the loaf should sound hollow when tapped on the bottom. Wrap in a clean tea towel for a softer crust and a lovely springy, moist, textured bread. For me, good old British Home Baking is Maggie's flapjack. I have so many good memories of living in Birmingham and this is one of them. My very good friend Maggie makes flapjack which is everybody's favourite. Maggie, who is a great home baker, says that she nurtured, amended and adjusted the recipe over the years until she arrived at the recipe she really likes best. I love her flapjack, and since I moved to London this recipe has been on my fridge. Melt margarine, golden syrup and brown sugar, then add the dry ingredients. Spread in tin(s) and cook at Gas mark 5 /180°C for 20 minutes. I like adding chopped walnuts and prunes. After making little Chelsea buns, I was wondering if I could make these a bit classier.... like Pain aux Raisins which I can't resist buying in the patisserie. I love the buttery flaky pastry with custard and raisins. However, sometimes I fancy a lighter version, something like bread based Pain aux Raisins. So, here is my little bread version of Pain aux Raisins. I used dried mixed fruit instead of only raisins to give more interesting flavour and texture. Well, I didn't make the custard though I could have done. I cheated by making custard from instant custard powder. I thought I had got rid of it, but the last packet was still there in my cupboard, and I had to use it up. I made the custard very thick in consistency and let it cool. I also soaked the dried fruits with some hot water to plump them up. You could soak the fruit with apple juice instead of water. I made a half quantity of bread dough, but added 2 tsp of sugar before adding water. After the first raising, I flattened the dough and spread the custard all over. Then I sprinkled the mixed dried fruit. I carefully rolled up the dough as if I was making a Swiss roll, and cut this Swiss roll look dough into pieces about 2cm in width and flattened them. I placed them on a baking plate, then baked in a 200c fan oven for 15 minutes. I like Japanese food though I don't cook Japanese food as much as I should, maybe. My sister in Japan and my Japanese friend in the UK sometimes give me Japanese food. Believe it or not, I've never bought Japanese food in the UK although a range of products are now available in supermarkets. Here is bread baked with Japanese dried red basil flakes which had been forgotten in the cupboard. These flakes are a mixture of dried red basil and salt which are the essential ingredients for making Japanese pickled sour plums, which are popular with rice in Japan. As pickled plums are a traditional filling for onigiri, riceballs, this salty red basil is also popular for onigiri. Red basil flakes are great just sprinkled on top of a bowl of rice. So, I thought to myself, why not put red basil in bread? Here is Japanese red basil bread. I can't ignore leftovers... that's my weakness. There was a half used pack of instant custard powder in a cupboard.... I know it sounds ridiculous, but I used it in these Chelsea Bun looking things. I wanted to make my buns milky and egg flavoured. Well, I thought they would taste like custard. So, as an experiment, I mixed 250g strong white flower, 1tsp easy-action dried yeast, a pinch of salt and 2 tbsp of instant custard powder. Then, I added 175ml warm water and kneaded for 10 minutes. I wasn't sure if it would really work or not, so I used half the quantity of my basic bread recipe. After the first raising, I flattened the dough and spread apricot jam all over. Then I sprinkled some cinnamon and mixed dried fruit. I carefully rolled up the dough as if I was making a Swiss roll. Then, I cut this Swiss roll look dough into pieces about 2cm width. I placed them on the baking plate, then baked in a 200c fan oven for 15 minutes. After taking them out I spread some more apricot jam on the top to give the buns extra shine. Rachel Khoo is a inspirational food writer and cook in Paris. I really enjoyed her first TV cookery show in BBC in March/April 2012. She is creative, fun and cute. :) I love her polka-dot dresses in various colours when she is appearing on TV. Apparently she has a bit of a polka dot obsession (at least 8 dresses/skirts in her wardrobe) almost as bad as the Japanese artist, Yayoi Kusama... so she says. Anyway, she looks great in polka-dot gear. In "The Little Paris Kitchen" Episode 2, she visited one of her favourite bakeries Du Pain et Des Idees in Paris. I remember that I visited many bakeries when I was browsing Paris for the first time. Pity that I couldn't spot this famous Du Pain et Des Idees. For me, tasting various kinds of bread was the reason why I wanted to visit Paris. Believe it or not, I used to be a member of The Japan Bread Appreciation Society called パンの会. ... haha, sounds a bit nerdy, doesn't it? Anyway, this video is a part of "Little Paris Kitchen" Episode 2 and she introduces how to make the most of your lovely bread. So, here it is! I used Cumin which was one of her suggested spices and sprinkled dried herbs on top. It was really yummy with Pam's Staple Bread. Definitely, this "Eggs in Pots" is a perfect way of enjoying your freshly baked bread. c'est tout .... that's it. Here is a cake to impress. Well.. I'm more of a rustic baker, but I have tried to do more intricate work this time. 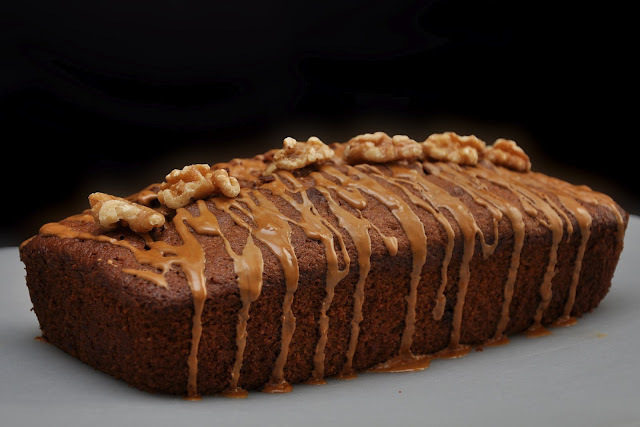 This is basically a classic coffee and walnut loaf cake, but when I was decorating it with coffee icing, I thought to myself, I could give this cake a classier name - French, perhaps? Sounds better, doesn't it? So, I checked Google Translate and got "Gâteau noyer" which, apparently means "Walnut Tree Cake". Without knowing this silly mistake I published this title on my Redbubble site. But a trusted Twitter friend corrected my mistake soon after she visited my site. Phew - So now it is officially "Gâteau aux noix et au café" (coffee and walnut cake). Believe it or not, it is actually a low-fat cake. I use low-fat spread instead of butter. I ignore the statement on the low-fat spread tub, "not suitable for baking", because it works well. However, I have to reduce the amount of liquid in the mixture as the low-fat spread contains more water than normal spread. The result is lovely, moist and guilt free....(I didn't mean gluten free). This is a coffee version of my Low-Fat Lemon Cake. I use soft brown sugar instead of caster sugar to give a rich and deep flavour. I also add very strong cofffee which is made with two tablespoons of warm water and espresso coffee powder instead of milk. Chopped walnuts are added instead of lemon zest. There was a jar of Green Pesto in the fridge. I used it for pasta and pizza filling and there was still a bit left in the jar. It had been neglected for a while and it was about time to use it up. So why not for bread? As always, I prepared basic bread which contained 400g strong white and 100g strong whole meal flour, as well as 2 tablespoons of porridge oats. Oats are really good for you, and give bread an extra chewy texture. I flattened the dough after the first proving, and spread the pesto, before rolling it up, like making Swiss roll. Then, I stuck some pieces of rosemary into the loaf. It smelled amazing when I was baking it, like being in an Italian restaurant. When it came from the oven, the pesto was slightly oozing out and the oil gave the bread an extra crunch. Ahh, the taste was incredible. I ate the most of the loaf for lunch, since it really should be eaten when it is still warm. This bread would go nicely with a chilled glass of wine. Happy days. Here are my Twin Loaves. I started regular bread baking after Christmas 2011, and I haven't bought bread from the shop ever since. I'm following a very simple bread recipe which contains 500g strong flour, 350ml warm water and 7g easy bake yeast. I found creating a steamy atmosphere in the oven is the key to making a crunchy and chewy loaf. I put some boiling water in an oven dish and then place at the bottom of the oven when the oven is ready to bake the loaf. ... and that's it! Nothing better than the smell of baking bread! It sells your house, apparently.